Place in food processor and run for about a minute and scrape down sides if necessary. 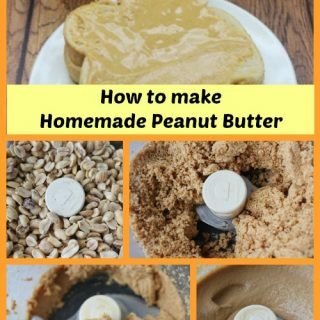 Then process for another 3-4 minutes or until peanut butter has reached desired consistency. If using salted peanuts, you do not need to add any extra salt. You can add honey if you want a little extra sweetness. If so, add about 1 teaspoon per cup of peanuts. One cup of peanuts yields a little over 1/2 cup of peanut butter.